Come November, World of Warcraft will be 10 years old. Crikey. I’m suddenly reminded of how fleeting time is, and of my own slow march towards death. Thankfully Blizzard is here to cheer me up, and you, if you’re feeling gloomy. They’re using throwing nostalgia around like currency, celebrating the game’s past as it moves towards the fifth expansion. Back in the old days, before we were relegated to sitting on porches regaling people with tales of this mythical time, there was a lot of tension between South Shore and Tarren Mill. Alliance and Horde clashed constantly, with nobody really winning, but lots of folk dying. This back and forth from early WoW is making a comeback in the form of a team deathmatch battleground. The whole area has been transposed into this field of battle, and the struggle can begin anew, but this time with a clear winner. Molten Core wasn’t the first raid I participated in, but it was the first one I ever watched people play through. It was exhilarating, and one of only two forty-person raids at the time. It’s still around, of course, and Blizzard wants to draw max-level players back to its hot caverns and lava rivers. So it’s being boosted and will be in the Raid Finder for the duration of the anniversary celebration. 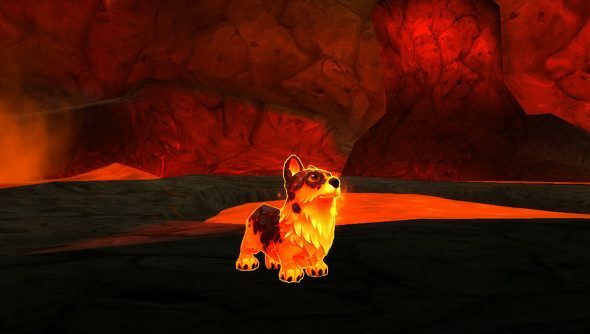 And to top it all off, everyone who logs in during the event will get the gift of a molten corgi, a savage beast with fury in its heart and hate in its eyes. Nothing but evil, those corgis. Blizzard’s not revealed the date of the event, but with it showing off the Warlords of Draenor cinematic and spilling the beans on the expansion’s release date, that would be a good time.